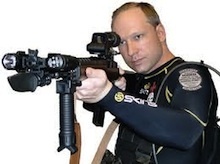 Breivik has admitted carrying out the twin gun and bomb attacks that killed 76 people in two locations in Norway last Friday. Writing in his 1500 page ‘manifesto’ - ‘2083: A European Declaration of Independence’ - Breivik praises the role of the British army in the wake of Bloody Sunday in Derry, in which 14 Irish civil rights protestors were gunned down. “There are few examples of the state being effective in a 4GW (Fourth Generation Warfare) conflict,” he wrote. “The only major example is that of the British Army in Northern Ireland after the events of Bloody Sunday. “A notable theorist of 4GW, William Lind, believes that the reason for the British being successful in that conflict was that the British Army did not use heavy weapons in that period and that the British Government forces attempted to get to know the areas involved in the conflict. “Also according to Lind the British did not engage in collective punishment and desired to keep civilian casualties to a minimum. Breivik listed Sinn Fein in a compilation of Europe’s “cultural Marxist” organisations which had to be opposed, but also expressed opposition to the Dublin government’s stance on the Lisbon Treaty. Sinn Féin spokesperson on Foreign Affairs Padraig Mac Lochlainn extended his sympathies on behalf of the party to the people of Norway. “Our thoughts are with the families of those who tragically lost their lives in this horrific attack and also with those who are injured.